Full of enthusiasm, recent college graduate Hayley Carter is thrilled to be working for a non-profit organization in Washington, DC. Having spent most of her life in the background due to family circumstances, Hayley is eager to step up and be heard—and bring much needed change to her new organization. Romance is on the shelf because now is the time to focus on herself and new career. Armed with a self-help book guaranteed to improve her personal and professional life, Hayley is ready to become the best version of herself. But will a baseball player for the Washington Soaring Eagles challenge her thoughts about dating and the person she thinks she needs to be? Brody Jensen is the new catcher for the professional team in DC. Baseball means everything to Brody and was his salvation growing up. Brody intends to make the most of his full-time shot behind the plate. Which means no serious relationships. 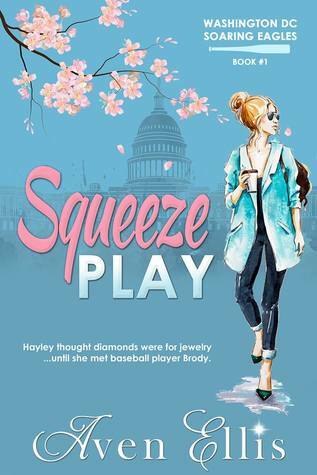 When the cherry blossoms bloom in the nation's capital, Cupid puts a squeeze play on Hayley and Brody. Will they be brave enough to love themselves and each other? Will love be called out? Or will their relationship be safe at home? Hayley Carter is ready, willing and able to make her mark on the world, starting at the non-profit organization she has just been hired at. Like a whirly-gig on steroids she is ready to take Washington D.C. on and come out on top, and trust me, she is ready, armed with a cause near to her heart, a self-help regime that promises to re-create her as a woman in charge of both her personal and professional lives. Look out, world, Hayley is getting better every day! Too bad her human frailties and Murphy’s Law makes her first-day vault into the “big people’s world” more like a trip and stumble that puts her iced drink squarely into the crotch of a god with a keen sense of humor, intelligence and quick wit and geez, he is oh-so-wrong for her. Brody has always been the twin with less, bad grades, little promise to become another Brainiac like his brother, but he is a star on the baseball diamond, the maestro that orchestrates the plays, the newest star catcher for the Washington D.C. Soaring Eagles. Too bad, he doesn’t realize all he has to offer the world, but one quirky blonde may be the yin to his yang, the peanut butter to his jelly or the Fruity Pebbles to his cereal milk…yeah, sometimes love is like that. Aven Ellis makes romance sparkle and shine! She creates flawed characters that are perfect to get to know and will steal your heart from page one! Sit back and get ready to let Ms. Ellis make your reading day! I received an ARC edition from Aven Ellis. This is my voluntary review!